What is this world coming to? 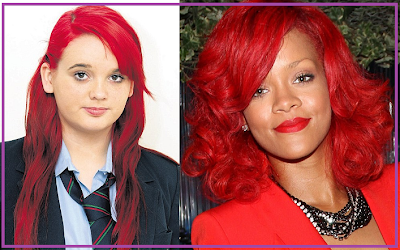 When "A" student Terri Bancroft decided to die her hair red, she didn't think it would turn out SO red. She also didn't think it would get her kicked out of school, and I'm more than positive she didn't think it would get her idol Rihanna to refer to her as her "hero", but it did all of those things. Around the Easter holiday, Terri says she just wanted to change her hair color and thought to die it red like Rihanna's who Terri is a big fan of. 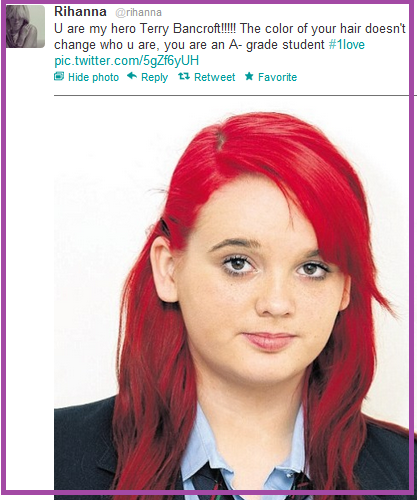 After dying it..she went to school only to be kicked out because of her hair color. To add insult to injury, Terri's mother is single with 3 kids and was unable to afford the money it would cost to get her daughter's hair stripped of the color, so she felt helpless in the situation. Terri has never been in trouble in school before and is an "A" student- to her mothers surprise those two factors weighed of little importance when it came around to her daughter's choice of hair color. Rihanna sent out the tweet and the Navy saluted their own by RTing her. Hopefully this is pay back to Terri for the humiliation she's had to face for wanting Rih's funky red locks! This school should be totally ashamed of the way they handled this situation. Her hair doesn't make her... Go Terri!! !